There may be several reasons as to why your lawn may not be in the best condition. It could be unhealthy from lack of feeding or in need or a good scarifying to remove thatch and moss or the ground could have become very compact if used regularly in general. In your journey to get your lawn back in tip-top shape, you need a few tools to help you out. Among the tools that you need is a lawn scarifier and a lawn aerator which we look at in this review. What lawn aerators basically do is remove soil cores from the ground or puncture holes into the lawn. The holes created then give the soil and grass roots a chance to get water and nutrients into the soil below the lawn, especially if it’s compacted. The process of aeration will help promote much healthier roots and help maintain deep roots systems. To get the best lawn aerator for you, there are a few things that you should be aware of. The information and products provided below will be of great help to you. Let’s dive in and explore the major points you need to know. Before we do, below you will find a quick overview of the winner of our 'Best Pick' the Yaheetech Lawn Aerator. We think it is the best choice for most gardeners looking to aerate their lawn as its easy to use and perfect for small and larger lawns. Lightweight thus easier to push yet still heavy enough to do a good job penetrating the lawn using the wide 36cm drum. Thick spikes so as to make sizeable indentations in the soil 1.4" deep. The handle can be dismantled to make storage easier. It is easy to assemble but does take a little time using the picture instructions. Our top 5 recommended lawn aerators for maintaining a healthy lawn. Lawn aerators come in various types and sizes. Although it may look like an old fashioned push mower, it functions completely differently. Lawn aerators do not have a lot of complex features making it easy to shop for but there are lots of inferior models available. In this guide, we will show you a few tips that will make choosing a good aerator much easier You get to learn what to expect from different models depending on the features provided and the type of lawn aerator you choose. Let’s first explain why you need to aerate your lawn. This is pretty clear but if you have a bare lawn or a lawn with dry patches, you need to aerate your lawn so that air and water can be infused in the soil. If you live in areas with clay soil, aeration is a good way to get a healthier lawns. In the case that you want to reseed your lawn and get a better germination rate. Facing water-logging issues?? Occasional aeration aids in creating more avenues for the ground to take in water. If you need to feed and weed the lawn, the holes created give the fertiliser a better chance to seep into the soil and marinate. You should aerate the lawn and them apply the weed and feed and them lightly brush the lawn which help get the feed into the soil. This should also be done before applying lawn sand. Lawns that experience some form of human/animal traffic need regular aeration for best results. What type of soil are you working with? This is where the journey begins. You need to understand what kind of soil that you are dealing with. Why? It will help you pick the right kind of aerators. Hard soil is harder to penetrate and therefore needs stronger blades. Clay soil is softer and therefore may need longer blades to make the aeration process a better success.so depending on the kind of soil that you are exposed to, ask for advice for the aerator. This is in the case that you are unsure. What type of aerator do you need? You would be surprised by the various kinds of aerators that are available in the market. This is a great way for manufacturers to make sure that all kinds of soils and functions are taken care of. These types can be manual or automated depending on your personal preference and are probably the most popular type of model as they are very effective and affordable. These kinds of models have spikes organised on a rolling surface with a steering handle. We find them more appropriate for soft soil conditions or damp soil as they can struggle to penetrate hard lawn, specially if very dry. Lightweight and fitted with a handle, they make work easier compared to a handheld spike aerator. The Greenkey 30cm Rolling Lawn Aerator is our best roller spike model and would of been our 'Best Pick' if it was not for the higher price tag. As with all garden tools you usually get what you pay for and this model is simply better built and will probably last longer and take heavier use. It features many spikes that are able to pierce the ground continuously. It is easy to assemble and use since it is not a heavy unit. The T-handle is also a feature that we appreciate since it makes steering possible and easier to use in general. Overall we think it is the best roller aerator and if within your budget is worth paying the extra cost. Great tool and well made, like all models its best used when the lawn in wet and damp. These have become very popular and are a creative ways for you to aerate your lawn regularly without causing damage. These shoes are fitted with spikes and straps so as to secure movement. These spikes depending on the model can be detached from the shoes. If the ground is hard or clay-like it may be better to seek electric aerators to provide the needed push. These handheld units are the kind that is employed if you have a small lawn and you are reseeding. Due to the structural design, the tines are hollow therefore extracting compound cores. This, in turn, provides better aeration holes. These kinds of aerators are perfect for clay soil and hardened soil that needs a bit of duress to get through. They will have to be cleaned regularly but apart from that, they are a joy to use but do take a little more effort to use. You can even use the aerators in areas that the electric aerators are unable to reach. If you do not mind having the soil cores lay of the grass it is fine. If you don’t, you will have to collect them thus taking up more time. Due to its design and number of tines provided, we chose the Kingfisher RC401 Pro Gold Lawn Aerator as it easier to use than the Garland Heavy Duty Hollow Tine Lawn Aerator alternative. The long 6 inch tines will make deep indentations that will facilitate deep root growth for your lawn grass. It is simple and works well with soft textured soil or wet lawns. We recommend watering well the night before if no rain is forecasted as it makes using it much easier. Clay and other dense solid may prove challenging but not impossible and it provides a real workout. Compact and stable, it is a lawn aerator that can perform making it well worth the extra effort. 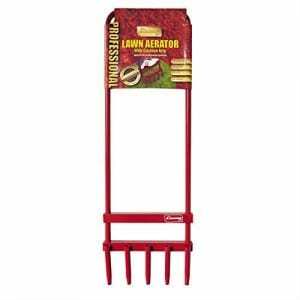 Rakes or forks are a common way in which people get to aerate their gardens manually. They are intended for small gardens due to their size and labour intensive nature. These kinds of aerators are perfect for soft soil areas. This is because not much force is needed to break into the ground. They won’t go as deep into the ground compared to the tine aerators, therefore, they won’t be good for intensive reseeding. They are however cheaper and easy to access. If you happen to own a huge lawn, you cannot relate to manual aerators to complete the job unless you have plenty of time and energy as it can be very time consuming. Instead, seek out larger units like the core aerators to help you out. These self-propelled units are normally petrol/electric based and cost a whole lot more than the manual models. These big bad boys gave large tines that are able to go deeper into the ground. The units also have more features to work with and are often sold as scarifiers as they have interchangeable parts to convert from scarifing the lawn with rakes tines to aerating the lawn. How deep do you intend to go? Whether you are using spikes or hollow tines, you should be aware of how deep they can go. Many manufacturers state on their products how deep the spike/tine can go. Some can go about 15cm deep while others shorter than that. If you are using electric aerators, some models will let you adjust how deep you can go. Generally as long as you can aerate the top 1-2 inches of the lawn you should be ok and see the benefits. Some electric/petrol models will let you select the speed at which you operate in. Speed control is important especially in the clogged up soil so that the pellets are removed with ease. In life, we have to be practical. If you have a large lawn, it will take you days to get it aerated with a handheld aerating tool. What you need is something with a motor so that you don’t have to do all the hard work. Even if you have a small lawn but it consists mainly of compacted soil, you will have a hard time doing it by hand. Consider the size of the lawn and the amount of energy you are willing to use. When you have that figured, picking the right model will be like a cool breeze on a summer’s day. If you need intensive aeration, look for machines with hollowed tines. Remember most electric and petrol aerators are sold as lawn scarifiers as they so both aerating and scarifying. Whether manual, petrol or electric, ergonomics is important. The finish on the models should be smooth so as to avoid getting blisters or straining your back. The handles have to be well positioned so that the user does not struggle to get leverage. If wheels are present, their quality is important to the overall durability of the product so they should not be neglected. There are several kinds of aerators available on the market. The one you need will determine how much you will spend. Be sure to keep within a budget so that you are able to get the best deal for your money. Be sure to check out if the goods have warranties offered in the case of problems with the product. We found a good aerator will cost you around £20-£30. Pinpointing the exact product you want without going through its pros and cons seems ridiculous. Below, you find five brands of some of the best brands in the market and some not so known brands but models which we found to be just as good and well built. Once you understand what each product is about, we are certain that you will be able to select the best lawn aerator for your needs. Below we start with what we think is the best lawn aerator for most gardens. The Yaheetech Heavy Duty Rolling Garden Lawn Aerator with its 3 piece steel handle is simple to use, efficient and best of all very affordable. It is very easy to assemble and use due to its structure and picture instructions. Featuring a handle, spike roller and wheels, the item is very manageable to push along specially on soft or damp lawns. It weighs a measly 3.1kg and it is a bit larger than the basic models. The working width is 36cm which is 6cm wider than other similar models we have looked at. This is more than enough to cover your lawns aeration needs. The very sharp spikes are 3.5cm (1.4") which is deep enough to penetrate in the lawn. The holes created are large enough to allow adequate water and oxygen to pass through. The unique thing about this unit is that you can take the handle apart in order to make storage easier. The 3 piece handle is very simple to assemble and spare parts that you may need are available. In general, the handle is well made so it’s hard for any edges to snag your skin. Wide 36cm aerating width and 3.5cm (1.4") spikes. Lightweight thus easier to push but heavy enough to help penetrate the lawn. Thick sharp spikes so as to make sizeable indentations in the lawn. Very affordable offering excellent value for money. Can be more difficult to use on hard lawns, best used after rain when the ground in more soft. The Yaheetech Heavy Duty Rolling Lawn Aerator is a good choice if your soil is compacted and you need to get some water and nutrients back into the lawn in for a healthier lawn. If you happen to have moss in your lawn, remember to scarifier your lawn first to remove the moss before aerating. We love the handle since it can be dismantled to provide organised storage in space limited areas. Overall, the build quality is adequate and its certainly well built and does as its designed. We looked at several similar designed models and this was probably the best one in terms of built quality. The only real downside is that it comes in several pieces so it take a little while to put together, now a major issue but don't expect to use it straight out of the box. It is within reach budget-wise and it is of good quality. After taking everything into consideration including price we felt this model deserved to be name our 'Best Pick as its probably the best choice for most people. Simple to use, affordable, what more could we ask for. The Greenkey Rolling Lawn Aerator is still affordable and very effective at aerating lawns and has is not as wide as our 'Best Pick' but has longer spikes and is slightly better in terms of quality. The roller lawn aerator is lightweight therefore you won’t need as much force to move it, especially in soft soil areas. The spikes that are responsible for making the holes in the ground are durable and strong. The strong spikes are made from rust-free material so that it is easier to clean them after use. The 45 spikes are spread out across the 30cm width. The 30cm width covers a wide space allowing you to cover more ground quickly. As for how deep the spikes can go, it is about 2 inches so that you can penetrate the ground effectively. The ergonomic T-handle provided is efficient at steering the unit in the right direction without straining your muscles too much. It weighs around 2.8 Kg and is very easy to assemble. You will find an instruction manual to help you with matters pertaining to the aerator. High quality product that is designed to last. Offers a wide aerator surface to cover more ground faster. 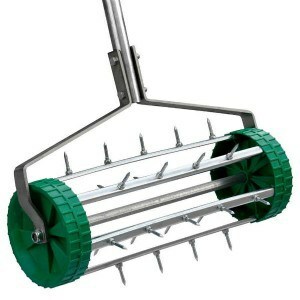 It has 45 spikes to ensure aeration of the soil is effective using the long and very strong 2 inch spikes. It is lightweight and simple to steer, specially in soft soils. Features a T-handle for manageable steering. Can be a little difficult to assemble and you will need a few tools as the tools includes although adequate are not ideal. The Greenkey Rolling Lawn Aerator is the model to invest in if your looking for something a little better than your average model but it still has its problems. First the length of the spikes are just about the right length at 2 inches and its is wide enough to let in air and water effectively without messing up the aesthetic appeal of your lawn. It is much more expensive than our 'best pick' but that being said its not really that expensive for a good garden tool and with good care, it can serve for many years to come. The main problem with this model which seems common with most roller type models is it takes a while to build and the tools included at not the best. If it's between this model and our Yaheetech aerator, then this model is a better choice if you are willing to spend the extra cost for a better quality tool, the final results on the lawn are probably the same but the built quality just seems much better with this Greenkey model. The ZDTech Lawn Aerator Shoes is a one size fits all type of aerator sandal, there are many different ones available online and in gardens centres but these must be one of the best. The sandal is made from durable material in order to keep up with the weight of the user and seem well built with very few people saying anything bad about them. You can see that the straps are well woven so as to secure the foot as it moves and they are a really good fit. Each sandal has 3 straps that have metal fasteners. The fasteners are metal because metal can handle strain more than plastic and we found cheaper models did have plastic buckles which can break easily. Each sandal holds 12 spikes that are fastened. These spikes are 2 inches in size meaning that you penetrate deep into the lawn. Different soil textures will offer varied experience but make sure that the soil is not hard. It is advised that you wear shoes with a strong sole when using the sandal. This is to protect your feet in the case you trip or a spike gets loose and starts pressing up but if ou have fastening the spikes on properly this should not happen. These sandals are the perfect way to do light fertilisation or maintenance of a small lawn. It is also a great workout! 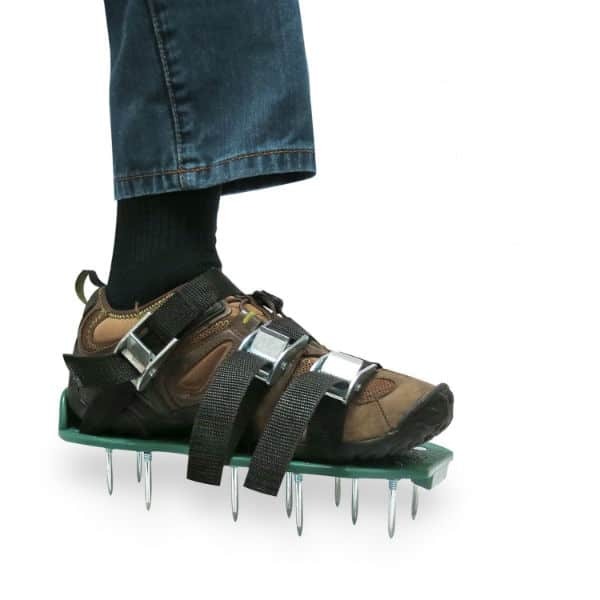 Perfect for aerating small lawns when walking on the lawn. Well-woven straps that are secured with metal fasteners. The heavy sole is able to keep up with the pressure applied by the spikes and the user’s weight. Features adequate spikes to make the most impact in one motion. One sizes fits all design. Lightweight, thus not much strain applied. Fasteners may need a better design as some users have found them a little difficult to fit properly. Only really useful for small lawns. The ZDTech Lawn Aerator Shoes are very affordable but it seems to have an art to it. and take a little practise. The idea is great though, you have to be patient to fix every individual screw and fit in the sandal with your shoe on. Other than needing patience, the sandal is easy to use n soft soil. On hard soil, you will have to apply more pressure and they get less effective. If you need a simple pair of aerator sandals for your soft soil then this model will work perfectly. It can’t be used on large lawns for obvious reasons, overall a great idea for smaller lawns. What we will say is there are many cheaper alternatives available but most will not be as well made as these. We looked at around 6 similar pairs and these were the only ones we would recommend as other models has plastic weak buckles, weak straps and generally cheaply made. 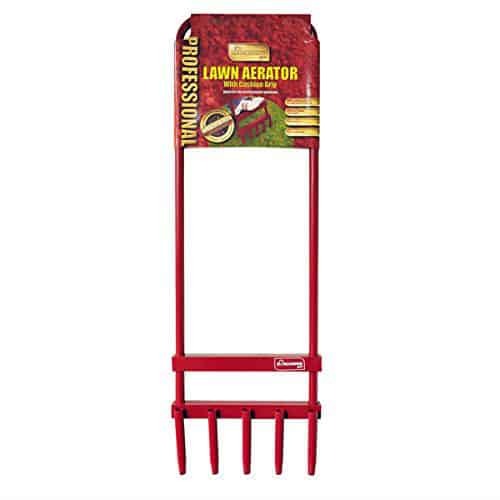 The Kingfisher RC401 Pro Gold Lawn Aerator is another manual tool that you can use to aerate your lawn and one that removes cores of soil rather than punching wholes into the lawn. This simple model is made of durable steel that is resistant to weather damage and will last for many years if maintained properly. The material is strong enough to withstand the impact of being forced to the ground yet still fairly light weight . Considering that it is a simple aerator fork, there isn’t much to it. It consists of five 6 inch tapered tines that you use your foot to drive into the ground. In some kinds of soil, especially clay, the deeper you go, the more effort you will need to wiggle the fork out but keeping it clean as you go will help keep reduce this problem. This unit weighs 1.94kg and measures 4.4 x 30 x 92.5cm and comes already assembled so there is no time spent putting things together unlike the roller type we have reviewed. It has a small footprint making it easy to store and maintain. Small lawns will beneficial since physical exhaustion won’t be too much. Ideal for professional use as is well made and can withstand heavy use if needed. Features deeply tapered 6inch tines to penetrate deeper into the soil. It is well finished providing comfortable handles for the consumer to use. Can be obtained at very affordable prices. Will give you a hard time driving into the soil especially in clay/compacted soil. Can be a slow process, specially on larger gardens. The Kingfisher RC401 Pro Gold Lawn Aerator is a simple solution for those who don’t need an elaborate aerator and does a really good job and we think as it removes cores of soil it actually does a better job that most models. It is of simple construct making it easy to use especially in loam/sandy soils and we would recommend only really using when the lawn in wet as it makes it much easier. It does not cost a lot of money so you can grab it for the occasional aeration of your small lawn but it certainly up to professional heavy use if needed. The main problem with this model which is due to the nature of it, the soil cores get stuck in the tines from time to time. To help avoid this we recommend having a bucket of water and a small 1 inch pipe cleaner and giving it a quick clean after every pass of the lawn depending in the length. This may take a little longer but it helps stop the tines getting blocked. Overall this is an excellent aerator but one that takes a little more effort but we think does a better job than most, specially if you want to apply lawn sand afterwards which is always recommended. The Garland Heavy Duty Hollow Tine Lawn Aerator is another manual fork but better design compared to some models in the market but not as good as the Kingfisher model we have just reviewed, the idea is great but not as well designed or as easy to use. 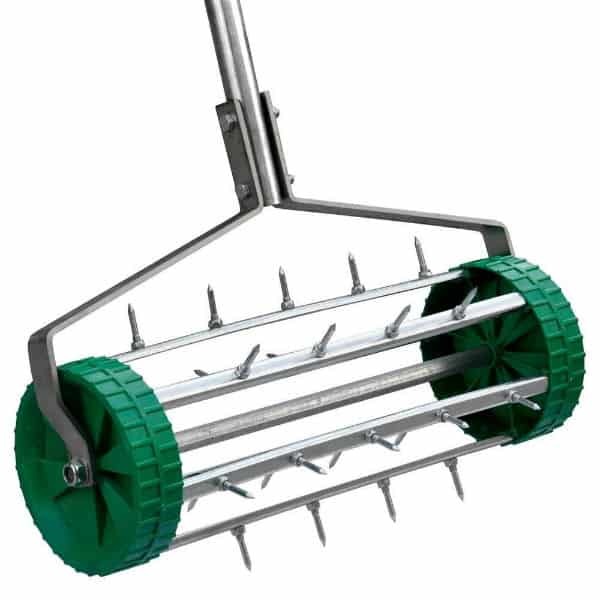 It features hollow tines that have the ability to remove soil cores to create aeration holes. The tines are made of stainless steel which is durable and it works great on wet lawns. Featuring four tines that are used dig deep into the ground so that the grassroots can receive the nutrients that are needed. You will notice that the manufacturer installed a T- handle which is what we liked about this model. The ergonomic handle allows the user to apply stable pressure without losing balance. The handles are well finished to provide comfortable but firm grip. The unit weighs 1.85kg and measures 90cm x 30cm x 3cm. This goes to show that it is light and therefore can be easily transported to the location of use. Storage won’t be a problem due to the size and structure of the item. Made of stainless steel, therefore, more durable. Features four sizeable tines that dig deep into the ground. It is lightweight therefore easy to use and store. Comes with a T-handle for better maneuverability. Tines tend to get clogged up more often than you would like. The coating on the tines prevents seems to make it harder to use. 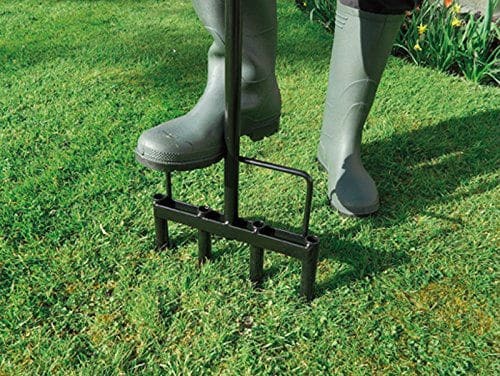 The Garland Heavy Duty Hollow Tine Lawn Aerator works well on soft soil but on hard soil i would not even try. Due to the design, you will find it hard to drive the unit in hard soil, we think the problem is that the tines are not tapered which they are on the Kingfisher model which seems to make all the difference. Clay soil will clog the tines making it inefficient so sandy loamy lawns are best for this model. We would recommend this unit for those who need to maintain smaller lawns. Those who need to reseed their lawns need a more effective aerator. On the good side, it is light and good on the pocket as its well priced. If you need a simple unit for occasional use, this might fit the bill, like the Kingfisher model, regular cleaning will help stop the tines getting clogged. Personally we thing the Kingfisher model is easier to use but the handle on this model should make it more comfortable to use. The models that we have featured today are mainly manual lawn aerators, if you want a machine powered model then see our Top Scarifier Reviews which also feature aerator compatible models. You can use these kinds of aerators to do regularly maintenance before applying lawn sand or lawn weed and feed in autumn and spring or patchwork. Electric aerators are better at facilitating large-scale aeration but manual models seem to be a better job as you have more control. Whichever model that you decide to go with, just make sure that the tine/spikes are sharp enough to pierce the ground. Comfortable handles are a necessity for long working periods so choose wisely. Make sure that what you pay for is what you get. Below is a quick overview of our top 3 models starting with our very affordable Best Pick. This honour goes to the Yaheetech Heavy Duty Rolling Garden Lawn Aerator with its 3 piece handle. The other models featured are of good quality but we think that this model offers more value for money and is still more than adequate which makes it obtainable for most if not all gardeners. It covers a wide surface area allowing you to do your work quickly. It even makes it easier for you to store the unit after you are done using it. The handle is ergonomic to make the user comfortable. It is appropriate for both domestic and professional users for lighter work. 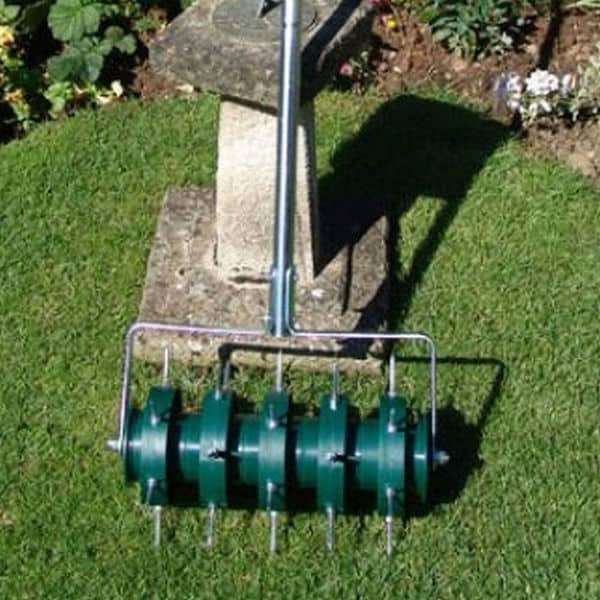 If you intend to use it more regularly, specially if your a professional gardener then we recommend investing a little extra and going for the Greenkey 30cm Rolling Lawn Aerator which has been made to a better standard in terms of build quality. Due to its design and number of tines provided, we chose the Kingfisher RC401 Pro Gold Lawn Aerator as it easier to use than the Garland Heavy Duty Hollow Tine Lawn Aerator alternative. The long 6 inch tines will make deep indentations that will facilitate deep root growth for your lawn grass. It is simple and works well with soft textured soil or wet lawns. We recommend watering well the night before if no rain is forecasted as it makes using it much easier. Clay and other dense solid may prove challenging but not impossible and it provides a real workout. Compact and stable, it is a lawn aerator that can perform making it well worth the extra effort. Overall we think it is the best roller aerator and if within your budget, is worth paying the extra cost. Great tool and well made, like all models, its best used when the lawn in wet and damp. Did you find a model that you like? We hope so! Visit us for more manual lawn aerator reviews so that we can keep you informed on the latest releases. We wish you a happy lawn and amazing time getting there. Catch you later! Response to "Top 5 Best Lawn Aerator – Buying Guide and Reviews"
Thank you for compiling this amazing list. I’m glad that I came across this guide. It will help me in getting a new plug aerator.